Opened the “Sukanaya Samriddhi Account” for your daughter? Not yet? Don’t wait to open an account! Do you know what the benefits of opening a SSA account are? All the advantages are discussed here. The “Sukanya Samriddhi Account” is another great step by government of India after “Beti Bachao Beti Padhao” project. It is a beneficial saving scheme. The scheme was launched on 22nd January 2015. It is a great scheme for girl child for their education and marriage expense. The account can be opened on a girl child’s name through her parents or legal guardian. Also Read:- How to Open Sukanya Samriddhi Account. 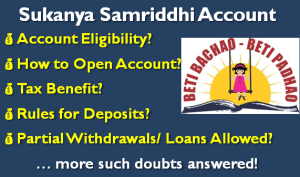 Here are the benefits of opening Sukanya Samriddhi Account. 1. Highest Interest Rate – Sukanya Samriddhi Account offers interest rate of 9.1% for the year 2015 and it is highest in all the other schemes. 2. Income Tax Benefit– For encouraging people to open the Sukanya Samriddhi account, government has announced that amount deposited in the account will be entitled for income tax exemption under section 80C of income tax Act, 1961. 3. Minimum Deposit to Open Account – The account can be opened with minimum deposit of 1000 Rupees. 4. Education and Marriage Expenses – The SSA is launched with the purpose of providing higher education and marriage expenses to girls. 5. When the maturity of account is finished, the total balance in account with added interest is paid directly to the account holder. 6. In SSA after maturity of account, the interest will be payable till the account is not closed by the account holder. 7. At the age of 10 years, girl child can control her account. 8. The Sukanya Samriddhi Account can be transferred anywhere in India. 9. Moreover, premature withdrawal of 50% is permitted for higher education of a girl child. In addition, you can use it for marriage purpose as well when the girl crosses the age of 18 years. These are the advantages of having Sukanya Samriddhi Account for your daughter. Give higher education to your daughter as well as save money for her marriage expenses. Don’t wait for anything and open an account today! Take the initiative to make her future bright!